Nestled within the results of a new joint lifestyle survey conducted by Yahoo! Finance and Fitness magazine is an interesting little NBA nugget. Asked to identify people who make way more money than they deserve, nearly a quarter of survey respondents picked LeBron James. In addition to questions about monthly finances, planned uses for tax refunds, spending preferences and how money impacts relationships, 2,000 Americans were asked, "Who do you think makes way more money than she/he deserves to?" The most popular choice was mom-and-wife-to-be Nicole "Snooki" Polizzi of "Jersey Shore" fame, picked by 51 percent of those surveyed. She was followed closely by Kim Kardashian (45 percent), with whom we are all very familiar. There's a big gap after the two reality stars — the third-most popular answer didn't get even a quarter of respondents' votes — but James is No. 3 on the list. Twenty-four percent of the 2,000 people surveyed said the Miami Heat superstar and two-time league Most Valuable Player gets paid more money than he deserves. The results make sense in real-world terms, of course — most people would likely argue that nobody "deserves" to make $16 million a year to do anything, let alone play a sport as a job. That, of course, to some degree trivializes not only the incredible amount of work that NBA players do, but also the value of the natural talent they must have to reach and remain at the highest level of their chosen profession, but still, it makes sense. It also shows just how large a chasm exists between the "real world" and the world of the NBA. Because in the latter, if anything, LeBron James is underpaid. For the record, James, 27, is making just over $16 million to play during the 2011-12 season, the second year of the six-year, $109.8 million contract he signed with the Cleveland Cavaliers before being traded to the Heat in July 2010. He's slated to make $17.55 million next year, just under $19.1 million in 2013-14, $20.6 million in 2014-15 and $22.1 million in the final year of the deal, according to the ShamSports.com salary database. Heading into this season, James had earned $76.5 million in NBA salary; factoring in his myriad endorsement deals and holdings, some estimates peg his net worth at somewhere between $100 million and $120 million. The $16,022,500 that James is being paid by the Miami Heat this year puts him in a tie with teammate Chris Bosh for the 16th-highest salary in the NBA, according to HoopsHype's salary listings. He makes less than Kobe Bryant, Rashard Lewis, Tim Duncan, Kevin Garnett, Gilbert Arenas, Dirk Nowitzki, Pau Gasol, Carmelo Anthony, Amar'e Stoudemire, Joe Johnson, Dwight Howard, Elton Brand, Deron Williams, Chris Paul and Kevin Durant. Some of those names are obvious outlier-laughers; others are legitimate, world-shaking stars. But even if you don't think James "deserves" to make more than all 15 of those players — if, say, you favor Paul's contributions from the point over LeBron's contributions from the wing, as Wins Produced often tends to — that metric still suggested James would be worth roughly $27 million more than the $16 million he's making in a league unfettered by salary structures and rules about how much players could make. And that was back in 2010 — if you check the numbers, you see that this year James is performing at an even higher level than he did back then, producing at a level of efficiency that, if sustained, would rank as arguably the greatest regular season in NBA history. Even if you don't buy the numbers, just watch LeBron this year — the range of defensive assignments he takes on, the responsibility he has for keying Erik Spoelstra's high-octane attack on both sides of the ball, the bad shots he's taken out of his game, the increased emphasis on post work, and on, and on. He's been the best player on the floor all regular-season long, and frankly, it hasn't been close. Those two words — "regular season" — will probably present a sticking point for a lot of fans. 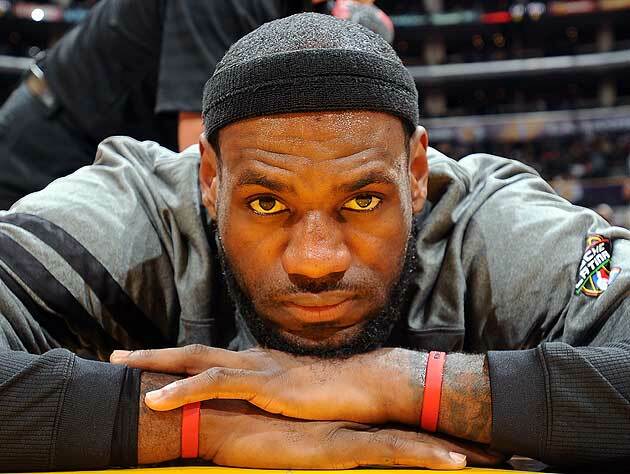 OK, fair enough — if you think LeBron's overpaid because he hasn't won a title yet, you're probably going to think that no matter what he does (averaging 40-12-9 a night, hitting 80 percent of his shots, not committing another turnover for the next calendar year, whatever) until he wins one. But there are a lot of guys in the league making more money for a lot less work than James, and if you think there aren't 29 general managers in the league who, given a blank checkbook and a wide-open market, wouldn't fall all over themselves to pay LeBron James more than any one of them, you're kidding yourself. Fine print: Conducted online in partnership with Ipsos MediaCT in November 2011, the Yahoo! Finance Financially Fit survey asked 2,000 Americans "representative of the U.S. online population" between the ages of 18 and 64 an array of questions related to their spending and saving habits, according to a statement. The results appear in the April 2012 issue of Fitness, which hit newsstands Tuesday, as well as online at the Yahoo! Finance and Fitness Online websites.